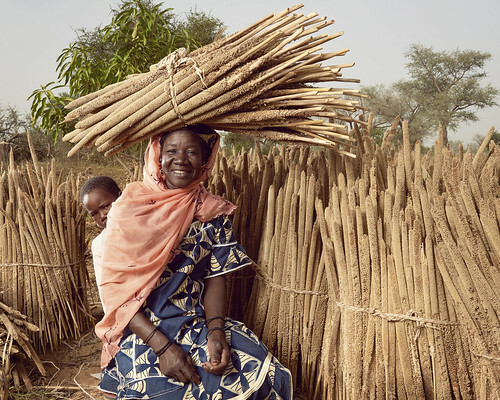 With a bundle of millet on her head, Abou Fumarou Mahamadou poses amid millet stalks dried in the sun. She belongs to a co-op of 32 women farmers in the commune of Tibiri in southwest Niger. The most widely grown grain in Niger, millet is one of the country’s dietary mainstays, along with corn, black-eyed peas and rice. The women also grow cabbage, lettuce, tomatoes, potatoes, eggplant and chili peppers. The excess harvest is sold locally as well as in Dosso, the nearest village, and in Niamey, the capital. This year, the women sold 90 baskets of tomatoes during the rainy season; the potato crop, on the other hand, was disastrous. And why? The seed had not been ordered at the right time, so it arrived late in the planting season. The same occurred with the onion crop.